Product #17039 | SKU PMWF55 | 0.0 (no ratings yet) Thanks for your rating! Many digital sensors can match and even surpass traditional motion picture film for resolution and low light image quality, but with approximately 14.3 stops of dynamic range, film has maintained an advantage over most digital sensors. However, the F55's exposure latitude is rated at 14 stops of dynamic range, for truly film-like rendering of highlights and shadows. Moreover, the F55 incorporates the same colour filter array technology used in Sony's flagship F65, for a colour gamut that is even wider than motion picture film. With 8.9 effective megapixels (11.6 total MP), the Sony 4K CMOS sensor captures a true 4K 4096 x 2160 DCI-standard cinema image. The sensor approximates the size of traditional 2-perf, Super 35mm motion picture film, which allows cinematographers to use their favourite lenses on the F55 without a significant disparity in apparent angle-of-view. The F55 is designed to accommodate a wide range of lenses. With the PL-mount adaptor, you can take advantage of acclaimed cine optics from Angénieux, Canon, Carl Zeiss, Cooke, FUJIFILM, Leica and more. Slip off the supplied PL-mount adaptor to reveal the native FZ-mount with an 18mm flange focal distance. The FZ-mount provides an interface for native FZ lenses like Sony's SCL-Z18X140 auto focus servo zoom lens or a range of adaptors for still lenses, including Canon EF, Canon FD, Nikon F, Leica M and more. The F55 incorporates the same advanced colour filter array technology as Sony's flagship F65, for a colour gamut that is even wider than motion picture film. 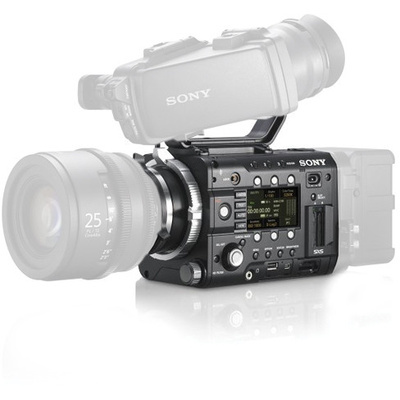 Designed with significant input from cinematographers, the F55 features an intuitive interface for a range of controls. Instead of diving through menus, you get direct, one-touch access to key shooting parameters including frame rate, shutter speed, colour temperature, ISO sensitivity and gamma. Assignable buttons mean that your favourite adjustments are always at your fingertips.